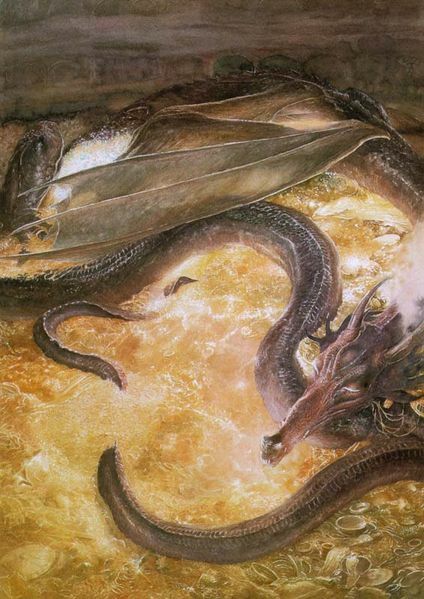 July 2012 – Avoiding "Watchful Dragons"
C. S. Lewis once compiled a series of essays entitled Past Watchful Dragons: Fantasy and Faith in the World of C. S. Lewis. His idea was to defend Narnia and other worlds from the “watchful dragons of society” that thought made-up stories were childish. That sounds insane now, but during the rising tide of modernism and rationality, folks like Lewis and Tolkien were eccentric, especially since they were well read scholars. But Lewis combates the ridicule with his usual gust of indisputable arguments, (honestly, what fools thought they could hold ground against Lewis?). In short, myths and fantasy are a way of finding truth about our own world by setting aside all the luggage this world comes with. There is something that myth can do that other forms of teaching and telling can’t. With a story, or, as Jesus is a fan of, a parable, we suddenly have a reason to care and get involved with these truths. The Lord of the Rings teaches us about love, redemption and companionship and we are drawn in. We can not help but care. And we close the book wanting to be more like Sam or Aragorn (in my case, I wanted to be Aragorn). Thank you, Mr. Lewis! Now step forward into our day. Fantasy is popular and accepted. Peter Jackson made Tolkien a hero in everyone’s homes, and the Christian themes are undeniable even if they are not blatant. I’d argue that Christian themes have slipped into many works of fantasy whether the author(s) intended it or not. After all, we’ve had the best examples left for us; and heroism, sacrifice, and hope are essentials in every tale. Interesting that Truth is so prevalent to the make-believe. God finds his way in, and he’s very adept at using our human stories and myths. I write fantasy because I love it. I can disappear into adventure and imagination when I read it; I can build worlds and cultures when I write it. But all this is nothing compared to what comes before the end of a really fantastic tale. The best ones always allow Hope to win, and it feels good. Perhaps we can’t help but let Hope win. It’s the way we’re wired as beings made in God’s image. Perhaps the best tales reaffirm our faith. That’s why Lewis and Tolkien wrote what they did, aside from enjoying it immensely themselves. They’ve begun to turn modern fantasy into a blood bath of anti-heroes and witchcraft. (Before we take this any further, I like Harry Potter. What I’m disputing are the seriously dark paranormal themes, and the violence for violence’s sake. Glad we got that cleared up). In fact, I’m not targeting anything in particular when I say this. I don’t even mind the D&D craze. It’s the story you make of it that counts. I’m not here to point fingers. But I think fantasy holds the potential of becoming so dark that we lose the hope and the redemption at the end. We are fascinated with these dark Dragons, and fantasy is sometimes the best avenue for them to hatch. As I write, I don’t want this to be allowed into my imagination. I’m not saying it won’t be dark. But the darkness isn’t what I’m interested in. I’m interested in the people that enervate the darkness. Our constant exploration with the darkest parts of the human soul have started to go too far. There are some roads that should never be taken. Some experiments should never be more than nightmares – quickly forgotten as soon as we wake up. As I write this, I realize that I’ve opened the way for more discussion than I’m prepared to handle in one post. (Hopefully more posts on this to come!) But as for me and my tales, we will serve that Hope – the Redemption that is so real and truthful in the end of our own world. Fantasy is not a license to explore wherever in Hell we wish. We know that we’ve gone too far when Truth no longer becomes the end goal. "Bear With Me In A Little Foolishness"
love people. take pictures. write things down. Bull Spec is a magazine of speculative fiction—science fiction, fantasy, and some bits around the edges—published quarterly from Durham, NC, US. The official news blog of Baltimore County Public Schools in Maryland. Do Justice. Love Mercy. Walk Humbly. point my feet toward adventure. The Trials of an Unpublished Fantasy/Fiction writer.